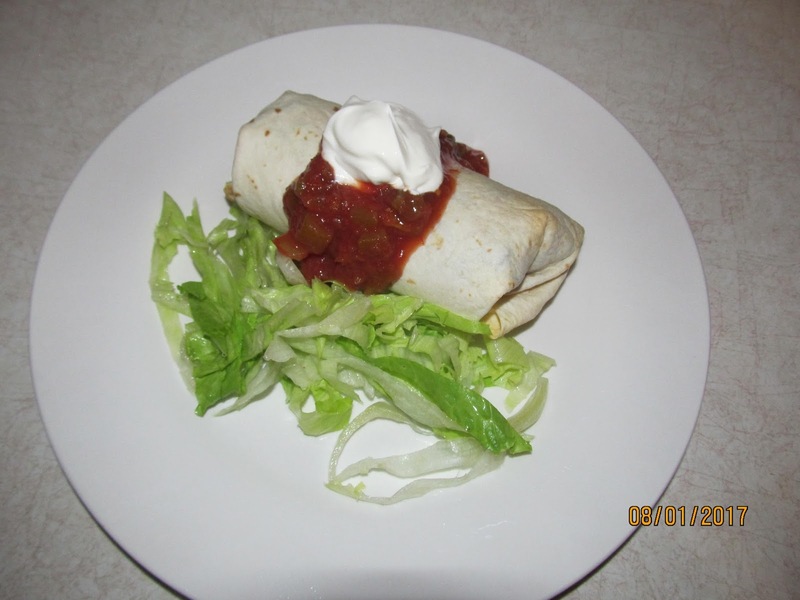 One of our favorite dishes is just a simple burrito, It only takes 10 minutes to prepare and 10 minutes to bake. – Rinse and dry lettuce and cut and put aside. – In frying pan Brown ground beef, and Drain. – Add all seasonings and stir well. – Add a can of black beans and mix well, with the second can take some of the beans and mush a bit. – lower heat to low. – With tortilla’s place one at a time on cookie sheet and add 1/3c cheese on tortilla, then the meat mixture. Wrap up and set aside. Repeat this process another six times. – Bake for 10 minutes, if you can wait that long. – once out of oven, Top with Salsa and sour cream, and lettuce on the side. My other half and daughter enjoy hot sauce and will add that to their toppings. I hope you enjoy these as much as we do. Look so easy and yummy! Must try these soon.